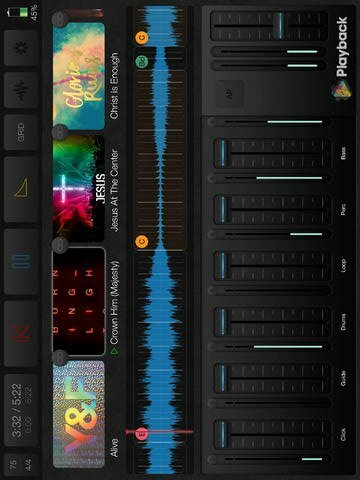 Playback turns your iPad or iPhone into a simple, yet powerful MultiTrack player for all of your MultiTracks, CustomMixÂ®, and MultiTracks CloudÂ® content. Playback has three subscription levels: Intro (Free), Pro, and Premium; all with a 30-day free trial. Playback contains many features, like Built-In Click, Pads, and Transitions. With â€œPlay of the Weekâ€, we release a new, free MultiTrack each week, so you can try out all of the features in Playback right away. â€¢ Songs are subdivided into "Song Sections"
All â€œIntro Subscriptionâ€ features are free. â€¢ SmartRoutingÂ®: Weâ€™ve pre-assigned every type of track to a bus. Use one of our *Supported USB Audio Interfaces and Playback will automatically route your tracks to the available outputs. â€¢ MultiOutsÂ®: Route tracks and buses to multiple outputs with one of our *Supported USB Audio Interfaces. Price may vary by location. Subscriptions will be charged to your credit card through your iTunes account. Your subscription will automatically renew unless canceled at least 24 hours before the end of the current period. You will not be able to cancel the subscription once activated. Any unused portion of a free trial will be forfeited if you upgrade from a free subscription to a paid version. Manage your subscriptions in Account Settings after purchase.